NWD 2016 Exhibit, staff arranging after the event. At the left: Susanne Tak. 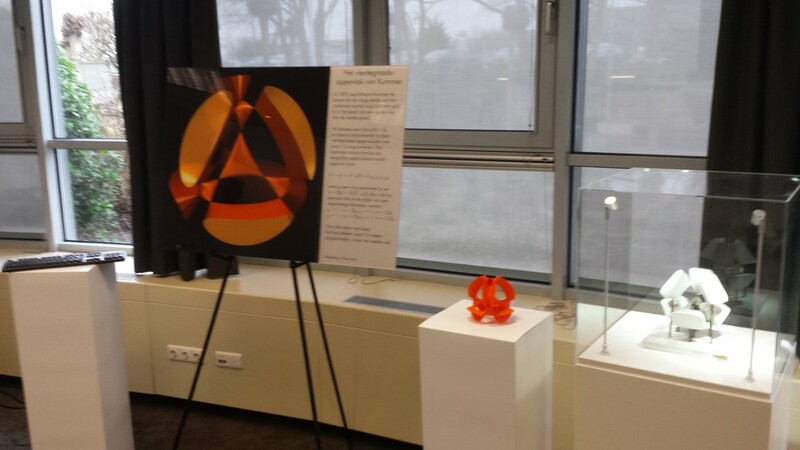 MO-Labs is honoured that the NWD 2016 organisers from Freudenthal Institut, Utrecht University, decided to make some of their beautiful historical 3D-models together with some of our 3D-printed modern Math Objects a central part of this year’s exhibition during the “Nationale Wiskunde Dagen” (i.e. national math days) 2016 in the Netherlands. 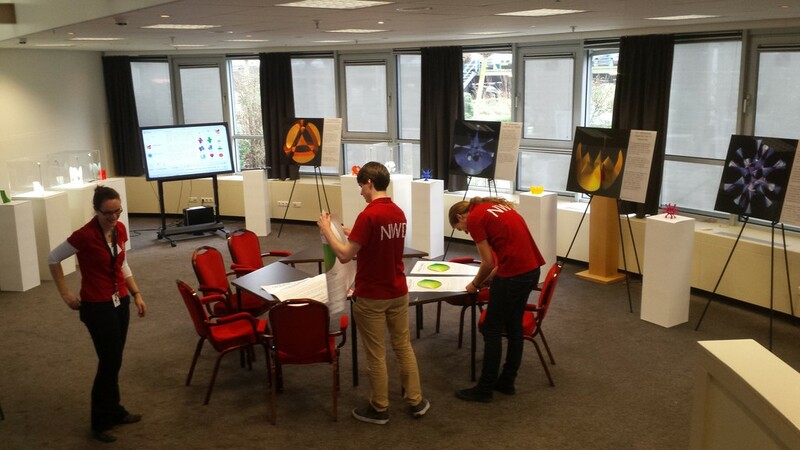 As every year, hundreds of Dutch math teachers came to this traditional event from February 5 to 6 at the Noordwijkerhout NH conference center. As part of the organising team, it was Susanne Tak’s task to put up an exhibition to accompany this year’s conference. 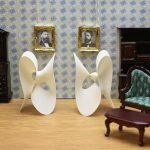 She had the nice idea to bring a small Imaginary exhibition to a new level by adding some of Utrecht’s amazing historical mathematical models and combining them with today’s variants produced by 3D-printing. And she asked MO-Labs, the specialist on modern variants of classical math models, to realize the part of the new models. In the months before the exhibition MO-Labs prepared the 3D-data necessary for the objects by either just scaling models in the MO-Labs database or by designing completely new models. Our Kummer surface visualisation at the left, our 3D-print of a smoothed version in the middle, and to the right the historical 3D-model (broken in several places). The rest of the exhibition consisted of some high quality 2d-prints, and three interactive touchscreens. The four printed 2d-images you may see in the picture at the top were also designed by MO-Labs; indeed these are part of the Imaginary exhibition which started its tour around the world in 2008 in Germany. The concept of the Surfer software used in one of the touchscreens is also in large parts ours; indeed, the first version of Surfer from 2008 directly built upon the ideas of our visualisation tool Surfex from 2001 by reducing the number of features and by simplifying the installation process and the user interface in many ways. Here, you can review and purchase the 3D-printed models presented at the exhibition, and related ones (such as smaller, cheaper, or more fancy versions). For most objects, you may choose the color you prefer. Feel free to contact us if you have further questions. Clebsch’s Diagonal Cubic Surface is probably THE most famous mathematical model. Since its first construction in 1872 by hand in plaster, it made its way to numerous collections of mathematical models. In contrast to the historical objects, our modern version only consists of a thin surface and not a hole body of plaster; which is much closer to the abstract mathematical object and which makes it much easier to see important geometrical properties of the object, such as its “holes” and “tunnels”. Click for more information and variants of the model. Ruled algebraic surfaces are much simpler in many ways than non-ruled ones. E.g., the complete surface is the union of all lines of a certain family of straight lines. And often, this family can be understood easily. E.g., to construct the given ruled cubic take a point on an ellipse and a point on a line and join them by a line. Now move both points simultaneously and continue taking the lines between them. The ellipse and the line used to generate it are shown on the object. In 1901, the first so-called Boy surface was constructed by Werner Boy. It is a so-called immersion of the real projective plane in three-space. 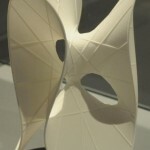 Its geometry is quite complicated, but one important aspect is easily visible with the model: It contains Moebius strips and is thus non-orientable. E.E. Kummer constructed and studied quartic surfaces with 16 singularities and several other interesting properties back in 1863. He already mentioned that it is not possible to construct a quartic with more singularities thus turning his surfaces into world record surfaces which cannot be improved. In the following years, several models of this very special object were produced using plaster. Our variant is a smoothed version where alle singularities have been replaced by small tunnels, in this way forming a so-called K3 surface. It was much later, in the 1930s, that Togliatti proved the existence of a new world record quintic (a surface of degree 5 with 31 singularities). Unfortunately, his construction is not explicit, so we show a construction by Barth from the early 1990s. At the time of Togliatti, it was not clear yet if quintics can have more than 31 singularities, but this was only proved in the early 1980s by Beauville. Since his work, we know that Togliatti’s world record will never be improvable. The highly symmetric sextic (degree 6) surface with 65 singularities was constructed by Barth around 1996. As we can see from the lower degree history above, small steps in the business of these world record surfaces take a long time, but after Barth’s new discovery, it only took one or two years until Jaffe and Ruberman were able to adapt Beauville’s proof to show that more than 65 singularities may not exist on a sextic. So, this example, again, is a non-improvable world-record. Which is not the case for the next degree, seven, where the current world record is 99, constructed in 2003 by the author. World records also exist for higher kinds of singularities such as the 15 singularities visible in this object. For higher singularities, much less is known. E.g., until now it is only known that a quintic cannot have more than 20 cusps. So, this surface is still the current world record, but it is not clear if this world record may be improved.